Two men jailed for the manslaughter of four rail workers at Tebay, Cumbria, have failed in a bid to have their convictions quashed. Rail boss Mark Connolly, 44, of Anglesey, north Wales, and crane operator Roy Kennett, 29, of Maidstone, Kent, argued their trial was flawed. 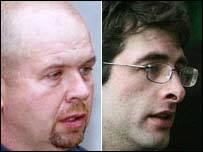 Connolly succeeded in winning a two-year reduction in his nine-year jail sentence at the Court of Appeal. The four workers died after they were hit by a runaway trailer at night. In March 2006, Newcastle Crown Court heard that Connolly, the boss of MAC Machinery Services, had deliberately disconnected the hydraulic brakes on two wagons because it was cheaper than repairing the wagons properly. He and crane operator Kennett were each found guilty of four counts of manslaughter through gross negligence at Newcastle Crown Court in March 2006. Lawyers for the pair told the London court on Thursday that the summing up of the judge at their trial was "very seriously flawed". Lord Justice May, rejecting Connolly's conviction appeal, said: "Standing back and looking at the matter as a whole, we are satisfied that Mr Connolly's convictions are safe and we dismiss his appeal against conviction." The judges said they were also satisfied that Kennett's convictions remained safe. The four men who died in February 2004 were Colin Buckley, 49, of Carnforth, Lancashire; Darren Burgess, 30, also of Carnforth; Chris Waters, 53, of Morecambe, Lancashire, and Gary Tindall, 46, of Tebay.